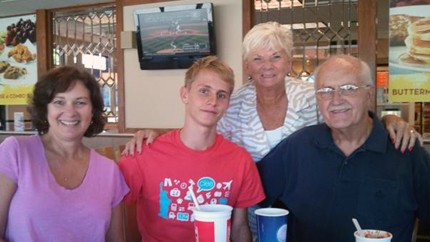 Left to right: Local Coordinator Cindy James, Jonas, Betty and Hubert enjoy a meal together at Wendy’s. Photo courtesy of Betty Patterson. Betty Patterson and her husband Hubert never thought about being a host family. But when a family at their church mentioned hosting a CBYX student, they jumped at the chance. Patterson and her husband welcomed Jonas, their exchange student from Germany, into their family and did their best to ensure he took advantage of every opportunity. And in turn, Jonas told them about his family and home back in Germany. Recently, his family came to the United States on vacation and stopped to visit the Pattersons. Jonas was always interested in going to new places and learning more about America and Kentucky, which is what Betty loved about hosting an exchange student. They also enjoyed visiting Frankfurt, Kentucky’s capital, together and learning about how the state’s government works.